Pricing does NOT include a generator rental, (needed if you are having your party at a park). The generator fee will be added to the total if your party is going to be at a park. Cash discount prices are listed below, before applicable delivery fee is added. Regular price via credit card is about 7% more. Rent a 13x13 Module Jumper or an 11x11 2in1 plus 2 tables (6ft), 16 chairs, 2 kid’s tables, 16 white kid’s chairs, and 2 Patio Heaters for ONLY $269 - (Reg. $285) $16 SAVINGS! Rent a 13x13 2in1 or 15x15 2in1 Combo with the Winter Special for ONLY $280 - (Reg. $299) $19 SAVINGS! Rent a 13x13 Module Jumper or an 11x11 2in1 plus 2 tables (6ft) and 16 chairs for ONLY $104 - (Reg. $115) $11 SAVINGS! Rent a 13x13 2in1 or 15x15 2in1 Combo with 2 table and 16 chairs for ONLY $115 - (Reg. $129) $14 SAVINGS! Rent a 13x13 Module Jumper or an 11x11 2in1 plus 4 tables (6ft), 32 chairs, and a cotton candy machine for ONLY $194 - (Reg. $210) $16 SAVINGS! Rent a 13x13 2in1 or 15x15 2in1 Combo with 4 table, 32 chairs and a cotton candy machine for ONLY $205 - (Reg. $224) $19 SAVINGS! or a 4in1 Combo Jumper with 4 table, 32 chairs and a cotton candy machine for ONLY $274 - (Reg. $290) $16 SAVINGS! 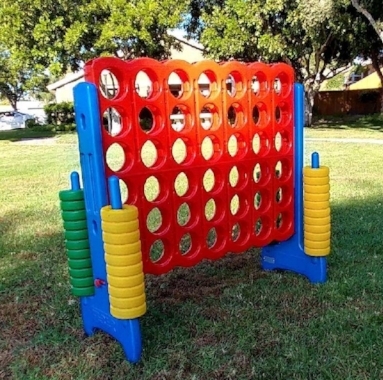 Rent an 11x11 Themed 2in1 (jump area + ball hoop) or a 13x13 (standard) Themed Module Jumper, 4 tables, 32 chairs, 2- 10x10 canopies, your choice of one food concession and a Jumbo Connect Four for ONLY $289 or $299 w/popcorn machine (Reg. $305 or $315 w/popcorn machine) $16 SAVINGS! GET 1 FREE 6' TABLE with any 4in1 Combo Jumper, 14' Xtreme Water Slide, or 14' Ball Pit Slide rental this month. Valid on Sundays ONLY. Mention this ad to receive the discount!